This Cananea Turquoise pendant necklace is inspired by the ebb and flow of the sea. As the waves pull back, delicate beauties are revealed to the light of day. The fascinations of the smallest tidepools are unveiled before the eyes. A microcosm of the entire ocean contained for a moment in the embrace of the shore. With each ebb tide, small mysteries are brought to light. A pool of the deep mysteries reflects the sky. A spill of enigma traced in delicate foam. An ephemeral beauty that lasts until the sea ebbs across the shore, sweeping the mysteries away. Sea Swept features a stunning stabilized Cananea Turquoise cabochon with a delicate tracery of matrix that mimics the shore. Hand forged in Argentium Silver, this unique pendant measures just shy of 2 inches in length, and includes a double 18 inch anti-tarnish Argenitum Silver chain, as well as a delicate pierced cutout along the backplate, showcasing the beauty of the stone. 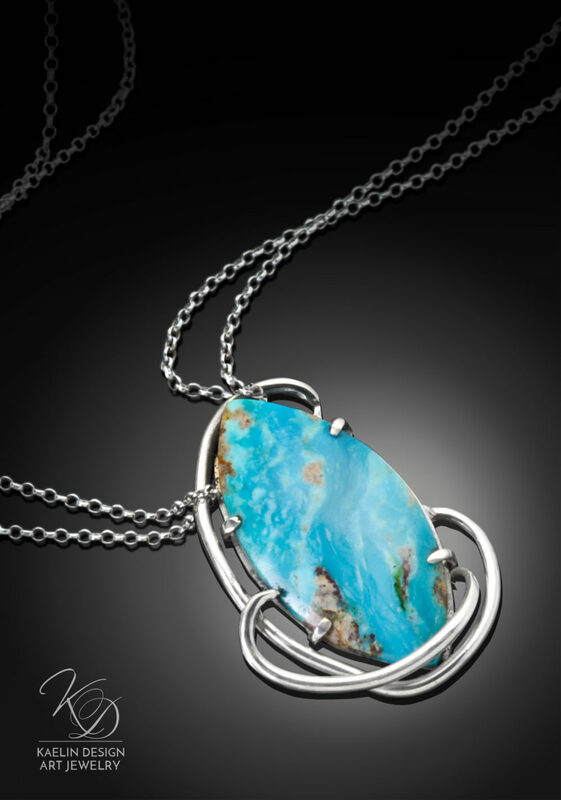 This turquoise pendant is strikingly elegant from every angle, just like the sea. 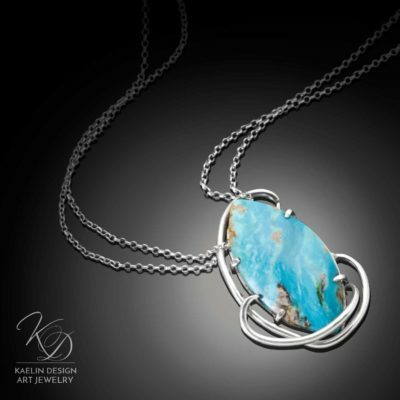 Designed for the woman who loves open waters, the serenity of the ocean, and the captivating secrets beneath the tides, this piece is one of a kind. From the unique designer cabochon, to the hand cut backplate and forged decoration, this piece is like nothing else- and is perfect for your art collection. 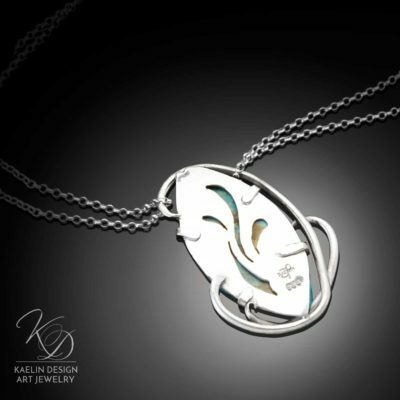 Upon purchase, this elegant art jewelry pendant will be nestled in a beautiful black box, wrapped in elegant ribbon, and shipped fully insured to your doorstep- ready for your instant enjoyment.